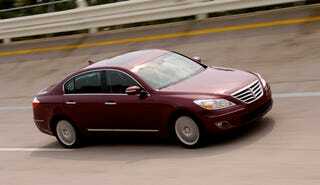 The new 2009 Hyundai Genesis has aced NHTSA's crash testing, scoring five stars in both frontal- and side-impact testing. The Korean automaker attributes its high scores to designing for the test the use of high-strength steel at critical points throughout the Genesis' body structure, coupled with electronic active head restraints and eight airbags. Keeping you from smashing the structure in the first place are four-wheel discs with ABS, along with stability control. Kudos, Hyundai: Good news, even if it isn't too surprising: Engineering has progressed so far in recent years that NHTSA is planning to revamp its crash test methodology in the near future.